This is the sixth in a series of six blog posts about my son and his experience on the last night of operation for Snow White's Scary Adventures at Walt Disney World. To read the entire series from the beginning, start with SWSA Final Night - Prelude. Thank you for reading. After Ben completed his final ride on Snow White's Scary Adventures, we gave our heartfelt thanks to all of the remaining cast members, and then we were escorted out of Fantasyland so that the maintenance workers could get on with the task of erecting the construction walls. Ken thanked us for allowing him to share in the experience of those last half-dozen rides, and then he and Robert left to go back to their respective lodgings for the night. Even though it was well past eleven, Ben was still buzzing from the whole experience and didn't show any signs of winding down. We crossed under the castle and then down through the hub, merging with the last of the lingering crowd on Main street. By the time we exited the park the monorail was already shut down for the night - we had to wait in line for a ferry boat instead. Ben was starting to agitate about Tinkerbell, so I dug out the Tink ornament that we had purchased at the start of the evening. That placated him at least for a while, but it was clear that he was on the edge of tipping over from happy to tired and cranky. I dearly hoped we would manage to get him all the way to the car before that particular time bomb detonated. Fortunately the boat came quickly. Before long we were walking through the Ticket and Transportation Center en route to the car. Ben stopped to take a photo of a Tinkerbell window decoration, which was when I thought to take a glance at his camera to see if he actually took any pictures during that last solo ride. As a matter of fact, he did capture a shot of his absolute favorite moment of the ride - Bashfull in the mine crying, "She's getting away, hurry!" Arriving at the car without incident, I gave Ben his nighttime meds and started the drive home. Usually in the car he listens to his iPod (almost exclusively Disney soundtracks) but for this occasion I went ahead and let him listen to the Snow White soundtrack on the car stereo. He tends to play the same track (or part of a track) over and over again, which can get a little trying, but that night I was just fine with it. For most of the drive he kept listening to the building music from the scene where the Huntsman warns Snow White to run away, followed by her terrified dash through the forest. It starts quietly, builds slowly, and then comes to a crashing climax. I heard that same track over and over again for about fifteen minutes, and then as we were nearing home he started skipping ahead through the tracks. Now this, you are going to think, is something I made up for dramatic license. I swear to you it is not the case. Anyone who knows me will tell you I just don't know how to make anything up and that I am a terrible liar. I simply could not have dreamed up this ending to the drive if I had tried. Ben very specifically and deliberately skipped ahead to track number 24, "Loves First Kiss". It is the last scene of the movie, where the dwarfs are gathered around Snow White's glass coffin mourning her death, until Prince Charming arrives to break the spell. Ben started the track when we were still about two miles from home, and as we entered our housing complex it was reaching its triumphant ending. I pulled into the driveway just as the final fanfare ended, where the movie would fade out after the final caption of "The End". It was just the perfect serendipitous touch to cap off an amazing day. As I write this now, it has been nearly a week since the ride's closing. It has taken me six full days to document our experiences from that night. In that time my direct memories have already started to fade. I wanted to get all of this down in as much detail as possible before my memories transformed from memories of the event into memories of remembering the event, eventually transmuting like a perverse mental game of telephone. Ben has not been back to the park yet. We will probably go on Friday or Saturday, and I hope that it will go well. I honestly don't know what to expect - will he just shrug his shoulders and move on once he sees those construction walls, or will he have a complete meltdown? I guess we will find out soon. Thank you to everyone who has taken the time to read this story. Okay so I just spent an hour of my workday here reading this but I was absolutely transfixed and COULD NOT stop reading it. I went all the way back and read the entire history starting with the move from Seattle. That's really one of the most beautiful things I have read in quite some time and so happy you have shared this with the world. Thanks so much for posting this and helping me shed a little tear here on a Thursday. I just wanted to thank you for sharing that beautiful story of your son. To be able to see the world and in particular SWSA through the eyes of such a special child was amazing. I hope that others read his story and are able to feel as blessed as I do for reading it. Thank you for letting us all into your lives and sharing these happy moments. Reading this story truly touched my heart. Beautiful! Loved the story, so glad Disney still makes those magical memories. I think Walt would be so proud and he would be touched by your son's devotion. I just finished reading the entire story and I cried throughout the whole thing. What a truly amazing night for your son and family!! Hi, I came across a link to this blog on Facebook, and as I started to read it on my phone I was immediately transfixed. I actually put up a pot of coffee, grabbed my laptop, and sat down so that I could really read and enjoy it. Probably best, since my tears would have likely destroyed my phone. Thank you for sharing this moment. I know I'm a complete stranger, but reading your blog I feel like I was there too - and I assure you if I had been, I would have been a weepy mess tweeting and Facebooking about it to all of my friends. I grew up in Florida and went to Disney more than most, though I still lived hours away. Now I'm a grown woman, and strangely enough, now live in Southern California, twenty minutes from Disneyland. We recently became annual passholders and love taking our two small daughters (3 and 1). To see their joy is to reawaken the joy I felt as a child - though it is multiples more as a parent. Thank you for sharing this amazing experience. I'm sending pixie dust your and Ben's way for his upcoming visit and that he will be okay and at peace even though Snow White is no longer there. I am about to be a Disney cast member and stories like these are the ones I will remember when I have a bad day at work. I will always remember that one of those kids might be just like Ben and this is the place they are the happiest so I need to be 100 % no matter what I'm feeling that day. I will always go above and beyond because of stories like this. You are truly one of the greatest parents in the world. Many others would have let this go a long time ago but you stuck by and rode the ride so that Ben could be happy and that is the best gift you could give him. If I see you in the world when I am there I hope you don't mind if I say hello. By all means, feel free to say hi if you see us in the park. I'm not sure where he will gravitate for the next few months, but I expect he will end up really liking the new Little Mermaid ride when it opens this fall. I was one of the SWSA cast members working that night and I just now was able to read your point of view of the events that I was gratefully able to witness first hand. This is the reason I am a Cast Member. To make and see Magic like this. I've been captivated by your story since discovering it online only a few months ago and shared it with my fellow cast members. We often discussed it while we were on break, especially if we had seen you visit that day. The conversation always included "Ben should be the last to ride." I'm so happy that our wish for your family came true. Thank you so very very much for sharing this amazing tale with all of us. You unknowingly made Disney Magic for the Cast as well. Came across Ben's story on a link someone posted on Lines. I went back and read the whole story. Thank you so much for sharing. Cried tears of joy for Ben- that he has had so many wonderful experiences there. My DS4 was diagnosed with PDDNOS about 10 months ago. We are lucky enough to visit the park every month or so and I relish in the joy it brings my son. Thank you again for sharing with the world. What a magical evening for your family! Thank you for sharing your story; such a wonderful photo of Ben with Snow White =). I hope the Little Mermaid ride fills the void left by SWSA. Thank you for sharing your story, and cheers to the amazing cast members who made it happen! It is wonderful that Ben has such love surrounding him. Your blog has brought back some of my own magical memories of riding SWSA as a little girl. I'm sad to hear it's gone, but it went out with quite a bang. What a heartwarming story. I found the link on Epbot like many others. It was really tuching to read about all the love people were outpouring to your family. My family was at Disneyland on May 31st and we were spending the early afternoon in Fantasyland for my 6 yr old daughter. So we too had our ride on Snow White's Scary Adventure the same day! Thank you for sharing Ben's story with us! once again for the most special evening I've ever experienced in any Disney park. Having finally read all the entries to this epic story, I start finally to grasp the horrible reality that the WDW SWSA is really gone - even though I was back at the park a few days later and witnessed the construction walls on the site that had been so magical place a couple of days earlier. If only my gout leg would have been better, I'd been a little more actively saying farewell to SWSA - but really, Ron and your beautiful family, you made the evening of May 31st most magical and memorable. Thank you from the bottom of my heart. I caught wind of Bens story through Epbot as well and cried happy tears through the whole thing. How truly magical. Thanks for sharing! Thanks for sharing!! I remember Ben from when I used to work at SWSA. I left a year ago to open Star Tours II: The Adventures Continue. I would always see Ben many times throughout the day. I am very happy Stacy and the gang could work magic for you guys! CONGRATS BEN!!! Thank you for sharing this wonderful story. It's stories like these that make me love Disney even more. 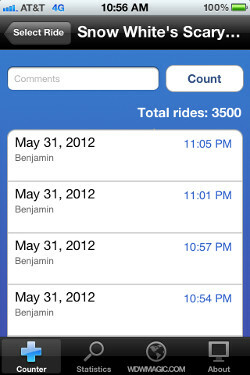 I'm happy that Ben got to be the last guest to ride. Beautiful! Was a beautiful, wonderful, special time for your son and whole family. I came across the link to your story on a website--thank you so much for sharing it. I'm sitting at my desk with piles of crumpled kleenex around me. Go Ben! Wow, amazing story, really touched me. Found the link to this through another website and saved it till felt up to reading it as knew it would be a weepy and have had a rough time this year. Although it did make me weep, it was in a good way. Well done to everyone nvolved, cant wait to take my kids to WDW but its long expensive trip from the UK so have to stick with sandy beaches in the rain. "He tends to play the same track (or part of a track) over and over again, which can get a little trying..."
Funny you say that's trying but don't say riding a three minute ride three quarters of 3,400 times is trying. I think I achieved the Zen of Snow White. Three minutes spent on that ride was actually pretty relaxing for me. I would very often take off my glasses, pull my ballcap down over my eyes, and just kind of zone out. Good times. May Grace flow freely to you and everyone involved in reminding us all that there is such kindness and greatness of spirit still in this world. This was an absolutely amazing story. I had tears of joy throughout. I'm so happy that Ben was the last rider...it seems a fitting conclusion to Snow White's adventure. This was one of the most touching stories I have ever read. All I can say is Ben seems like such an amazing, lucky kid, and that that night must have been truly special to him. Thank you so much for sharing this story with me and the rest of the world. Thank you for sharing this beautiful story. Ben is an amazing young man, and you are both amazing parents. A 39 year old male sitting crying in his office so deeply moved by this story. I discovered your Blog through a link on wired.com and read through this story in one go. After my tears finally went try I shared the link with colleagues and friends to share this amazing report and to show people that you can reach the stars if you have family and friends by your side who stand by you. A warm and dearly HELLO from Germany to your family. That was amazing. Beautiful, happy, sad, touching, and so full of love for your son. Thank you for sharing Ben's final ride with us. What a warm, wonderful story. Thank you for sharing it. Much mouse-shaped love for you, your family, the amazing cast members, and, of course, Prince Ben. Thank you for sharing Ben's last times with his ride. I hope things go well in the future as he realizes it really isn't there anymore. Congrats to Ben and you're a very good dad. Sad about the ride. I hope Ben does well in this next stage of his life. Thank you SO much for sharing this wonderful story. We too have a daughter with ASD who is 12 and WDW is one of her favorite places in the world. Her favorite ride it It's a Small World. I could just picture her through Ben's story. I hadn't even finished reading the prologue and I was already bawling. This is why we love Disney, they get it! Best wishes to you all! It is wonderful to see the magic Disney has brought to your son, along with so many others. Disney cast members have proved to be the kindest, most decent, people. And this story reclaims my faith in Disney's mission for families to enjoy the parks in their own special way. Thank you for sharing this incredible story, it has brought tears to my eyes. Thank you so much for sharing your account of Benjamins final ride. My son is autistic as well, and LOVES any amusement park ride. Especially Disney world and Six Flags. ( I think he would live there if he could!) He is 25 years old and has a limited vocabulary. But can talk to you about ALL the characters in his favorite park. And one of his favorite songs is "It's a small world, after all". Of which we sing ALL the time. It was refreshing to hear about your son Ben, and the positive experience he had at Disneyland. We took our son to Walt Disney world several years ago, and it was not so positive for him. Lines were far too long for him to wait happily in, and there were a lot of very rude people that visited that day. But Josh still loves Mickey Mouse and "the duck" he calls him. Thank you again for sharing, and May God Bless your family and Benjamin especially in all his endeavors. I wish that I could have been there, if only to experience such a collective joy, be it bittersweet. We all have much to learn from Ben and those like him, who can love so deeply and easily. It wasn't my intention to read a blog series this morning. I had intended to, uuummm, something about WDW, but I can't even remember now! Life gives you what you need. I surely needed the warmth in my heart from reading about Ben and his family. Don't we all? Thank you for sharing such a touching story. I was deeply moved by the joy that your son experienced. Thank you for your courage to share something so special and personal. I wish your family and Ben much joy and continued happiness. Thank you so much for sharing this truly amazing story. I'm in tears at work and trying desperately to pass it off as sniffles. I hope that Ben and your family continue to enjoy the parks even without Snow Whites Scary Adventure. Prior to this past november when I made it to the parks on my honeymoon, I hadnt been since 98, (after that year it never worked out that I could join my family on the bi-yearly march break trip from canada) so I was saddened to hear the ride was closing - thankfully I visited it at Disneyland Paris a few years ago, when a bad joke in northern england about going to paris and only going to Disney turned into 2 magical days there. I see I have accidentally found your blog & story on the 1 year anniversary of the closing of SWSA. I have read every part of his last ride and also the 1,000 ride. I'm not too proud to say that I cried during each of those. Disney and the Dis CM are truly awesome and I am so glad that Ben could have that experience. Now, my question is-- what does Disney do with the parts from the ride? Is there part of the ride you might be able to buy as a souvenir? Maybe part of a drawing from one of the walls or one of the statues? I'd love to know if you can buy them... or if Ben has any memorabilia from the actual ride. Actually the one year anniversary will be May 31st, still two months to go. 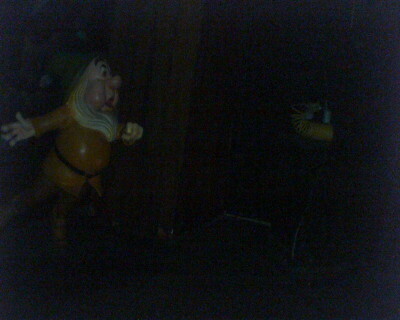 Regarding ride artifacts, some of it is being reused for the new Seven Dwarfs' Mine Ride. As I understand it, Boston of the rest was crated up and shipped to Disneyland. Very few items actually made it out to the memorabilia market. Ben has photos, videos, and of course his memories. Tears. Thanks for sharing this story! Wow! What a beautiful account of a truly magical event. I'm sat here in tears. I hope Ben found a new ride to love. Thank you again. I'll probably re-read this for the rest of my life. You are an exemplary parent. Namaste.